• Take Two Eggplants And Clean Them Well. Slice Them In Half Inch Thickness And Marinate With Ginger Garlic Paste, Red Chilli Powder, Turmeric Powder, Coriander Powder, Garam Masala Powder, Salt And Lemon Juice ‘1 Lemon’ And Keep It Aside. Roast The Remaining Eggplant On Cooking Range Till It Is Cooked Properly. Once Cooked, Peel The Skin And Roughly Chop The Eggplant. Mix In Chopped Onion, Green Chilli, Ginger, Fresh Coriander, Salt And Lemon Juice ‘1 Lemon’ In A Pan, Heat Some Mustard Oil On A Medium Flame And Pan Fry The Marinated Eggplant Slices Till They Are Cooked. 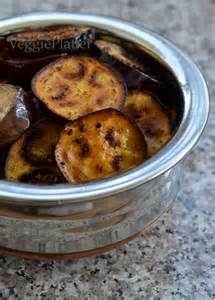 Serve It Hot With The Roasted Eggplant. • Boil Whole Tomato And Puree It Nicely In Mixie. Take Out In A Bowl And Add Chopped Ginger, Green Chilli, Coriander, Salt, Sugar, Lemon Juice ‘1 Lemon’ And Mustard Oil. Mix Well And Serve It With The Bhajja. Serve It With The Bhajja.